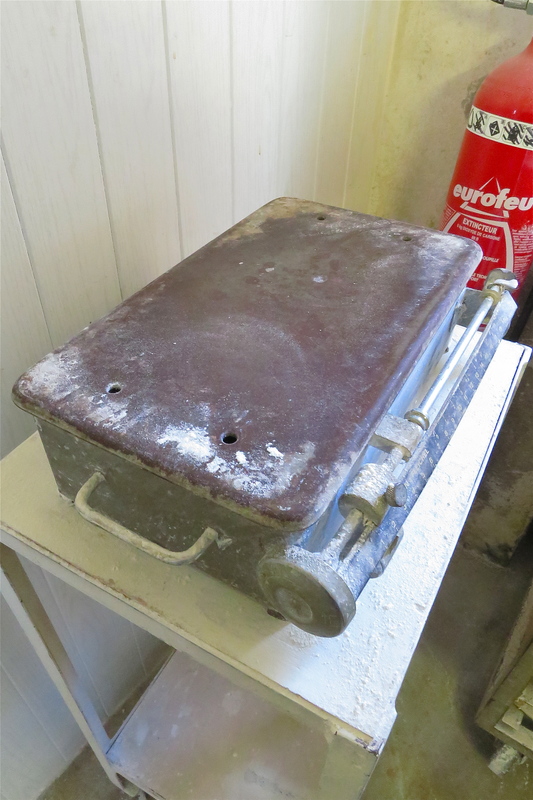 It’s not really something you’d expect to happen in deepest rural France – but then there aren’t too many people with the same interests as my husband, so when a casual exchange about life stories with the baker leads to a demonstration of fish photographs and then an invitation to see the oven, we can’t turn it down. You see – anything can happen when one fisherman meets another! 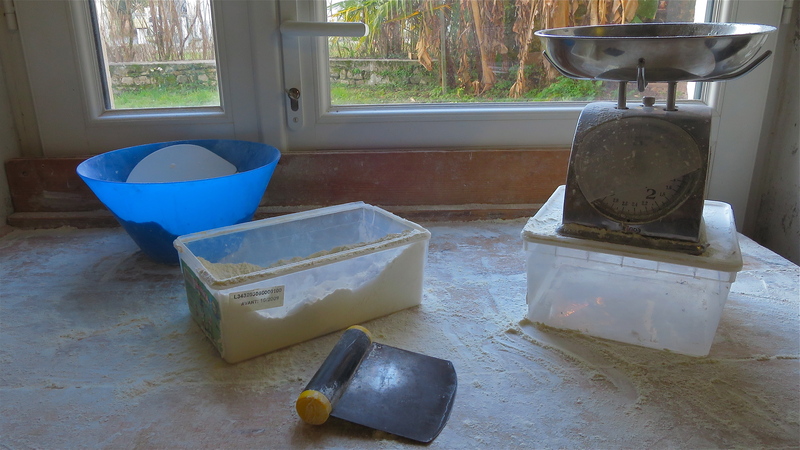 And this sparked the beginnings of an idea – over the next few months I want to share with you stories about the local artisans we meet in France and what their jobs really involve – so we start with the life of our village baker. Truthfully, we’d been wondering about the baker, David Gaillardon, for months. We had lots of questions that needed definitive answers. How did he survive ? What time did he have to get up to produce the wonderful bread and other goodies we saw each day in the window of our tiny local boulangerie? Has the wonderful tradition of french baking succumbed to the deep-freeze? We’ll start at the beginning. 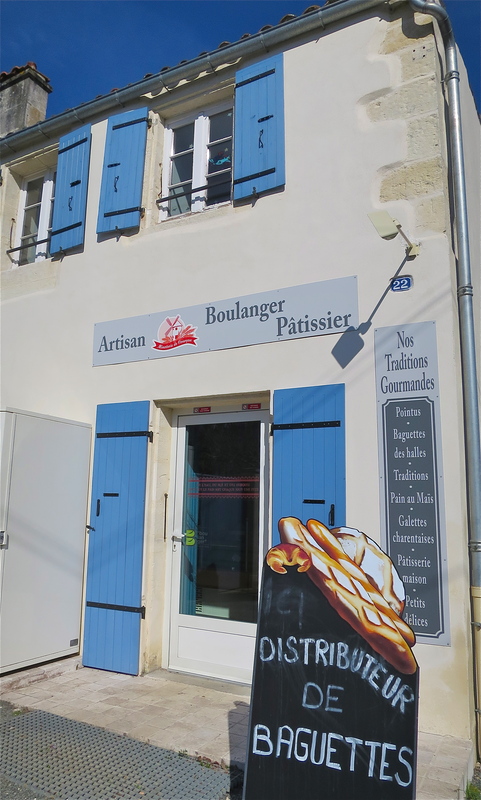 There is a bakery in our village. Most reasonable sized villages have one. Towns have one on each street. Bread is a staple of french living and has been for centuries, a staple with its roots entrenched in the mists of time when if there was nothing else to eat, then there was always bread and not just cake, as Marie Antoinette tried to explain before she lost her head in 1793. Bread and patisserie is a constant of French life and covers a broad subject involving a full spectrum of edible delicacies ranging from the humble croissant (an art in itself) to the magnificent chocolate log of Christmas (the amazing Bûche de Noël). In between are sundry tartes, gateaux and petits fours, and there is also the use of the oven for cooking the village’s sunday roasts in some far-flung locations. 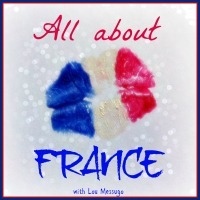 La boulangerie is a magnificent mix of flavors, smells and typical French ingenuity. And truthfully, no matter how good the food at a table, the French will always have bread at it too. So, the morning of our visit arrives, and we find ourselves outside the small door of the shop just as the sun is rising, and entering the shop David swings aside a section of the counter and leads us to the dim and dusty warren behind. There is flour everywhere. There is a small kitchen behind the shop, then a prep room with a long counter and a vast array of knives and chopping boards, and then the oven in its own large space, jostling for room with a huge mixing bowl and two 6’ high proving and chilling cupboards. Along one side of the room is a big long machine that seems to be left over from a carpet factory – it turns out it rolls the baguettes into shape. There is flour in here too – lots of it – everywhere. It is the mark of a man who works at high speed for small concentrated lengths of time – for even as we ask questions and take photographs, David is a blur of movement, moving between the oven, the proving cupboards, the shop (each time the door-bell tinkles way out the front), the rolling machine and the bread baskets. While he works Mr H and David talk about fishing and electricity consumption, and I throw in questions more suitable to the surroundings. In a very short space of time we have plenty of answers and many more questions. There are some simple facts we learn quickly. David has been a baker since he was sixteen and he hails from a coastal town a few miles to the south called La Palmyre. 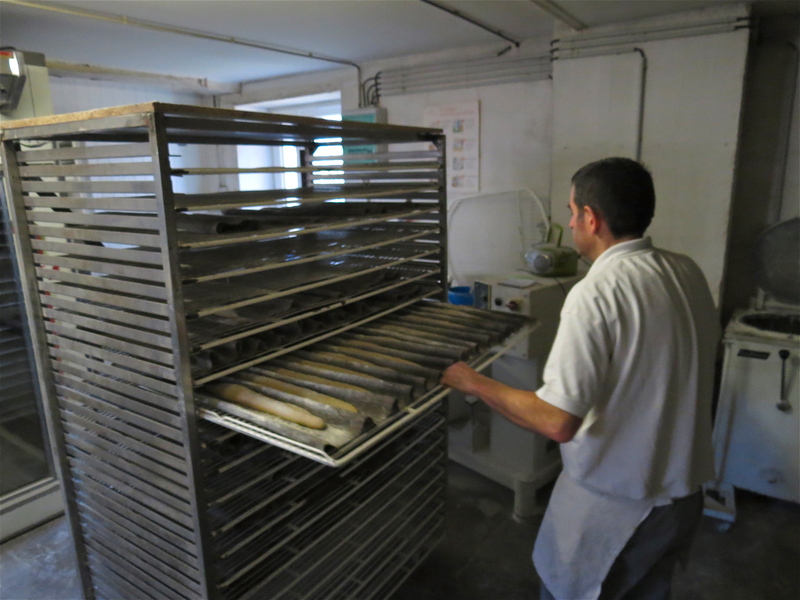 In his small, dusty bakery, he single-handedly produces between 300 and 400 loaves of bread each day, AND the patisserie we see out in the shop. I am in awe. I know how much effort a single loaf of bread makes, even with a bread machine, but to make that many ?? It turns out that of course there is a regime. A method to the madness, and behind it all, a story. David’s day really starts at about midday. This is when he combines the four ingredients, salt, flour, yeast and water, needed for his bread – his dough. 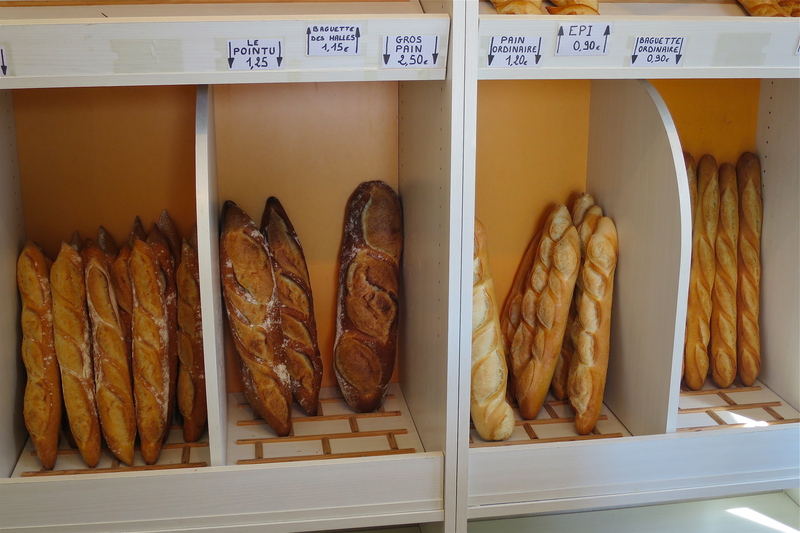 In fact, there are two doughs – one for the white bread typified by the traditional baguette, and the dough needed for the pain de tradition, which is not quite the same thing. David explains that the older generation of customers prefer the bread of their youth, the white crusty baguette, while many of his younger customers have come to like the breads he makes with a flour in which the miller leaves husk and grain in – a minute quantity – but enough to give a difference to the dough and the resulting loaves. This is the pain de tradition. There are also some cereal loaves, and the very different gross pain, a huge mountain of a white loaf with a half-inch thick burn crust that is cut into pieces and bought by weight. All told, there are normally nine different breads on the shelves each day. In simple terms the dough is then divided into the required quantities and then has its first proving. During the afternoon, at various times, this dough is then shaped in the rolling machine and then proved again until needed. The two huge proving cupboards both warm and chill for storage. At odd times during the latter part of the day, David also attends to the requirements of the patisserie section of his shop, making pastry, rolling croissants and pain au chocolate, making flans and tartes, cutting fruits, shredding chocolate and mixing whatever else he decides to bake that day – biscuits, galettes and eclairs all feature on his shop shelves. The basic premise is that when David leaves the shop by nightfall, he has done everything for the next day and final part of the routine. 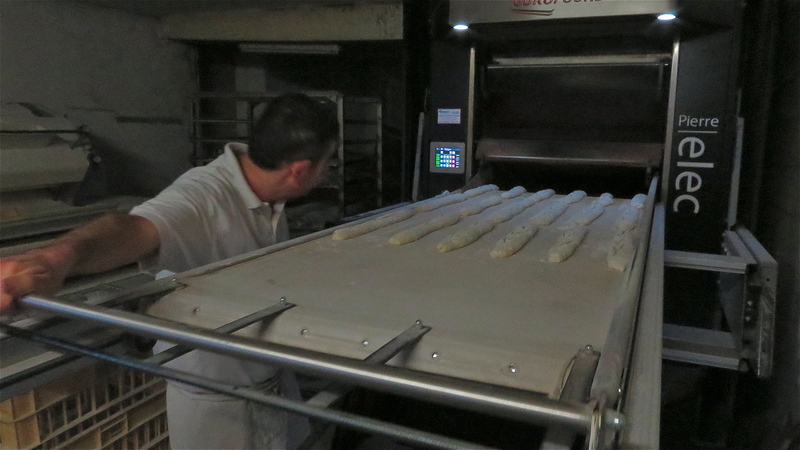 Each morning he arrives at 5.00am, goes through to the oven, already hot and ready for use thanks to the automatic timer and simply rolls the first 10’ long trays of proved loaves into the furnace and starts all over again. By 6.00am, the shop door is alight and the first customers appear. 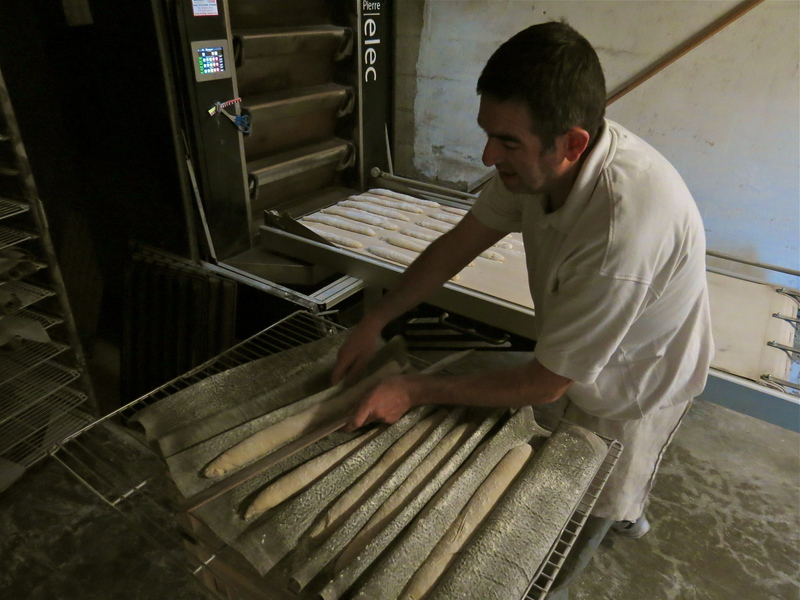 He bakes bread three times each day as is traditional in France, producing fresh baguettes for each of the three main meals, breakfast, lunch and dinner, so that the bread, containing absolutely no preservatives is always fresh. All of this information is imparted as David works with his precious dough. As is typical of someone who works with an established routine, his movements are economical, his handling of materials and tools practiced, and his time is a steady pace of perfectly executed routines. 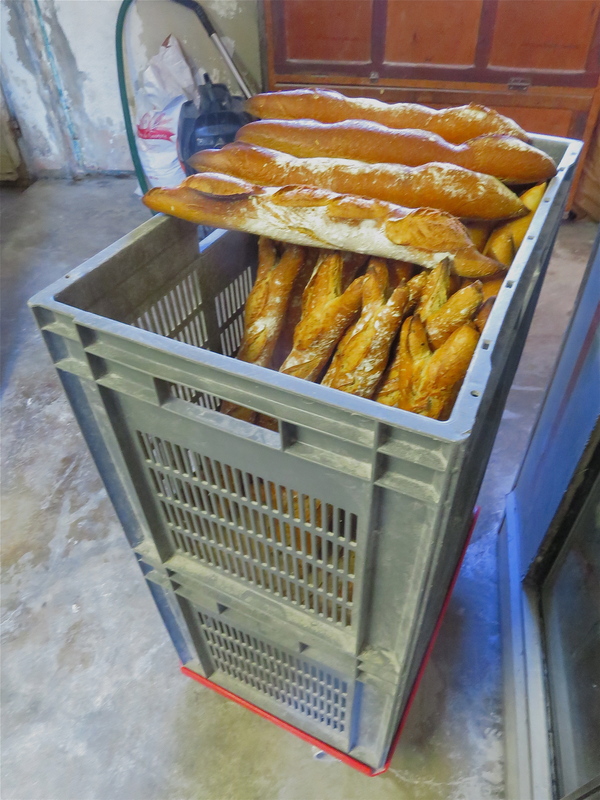 As one shelf of loaves appear from the oven, another underneath is being readied to go in at another level. 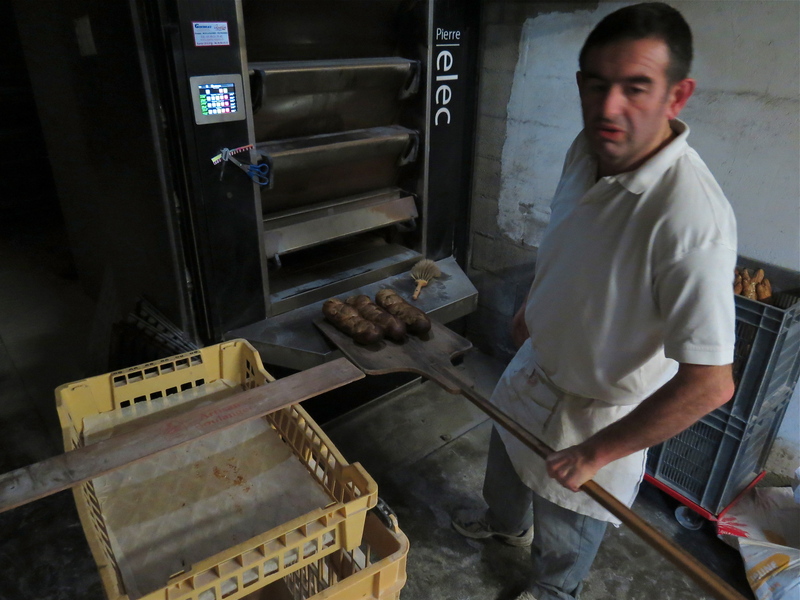 David explains succinctly that the oven he has now is only 4 years-old, a substantial 37,000 euro investment that replaced a cast-iron monstrosity that he inherited when he bought the business seven years ago. The old one had to be broken into pieces in situ during the exchange to get it out of the door and in life it used 500 gallons of heating fuel a week. The new electric oven sits proudly in a much smaller footprint, replete with a touch pad of blinking lights and buzzing alarms, its three bread ovens and its patisserie oven aglow with heat. David’s fingers work at lightening speed, setting times, heat and alarms without hesitation. The whole experience is akin to watching a concert pianist work with play-dough. I ask a few more pertinent questions in between the men’s fishing and hunting conversation. A strange fact emerges – David does not live in our village. The building we assumed was both bakery and home is just a bakery below and someone else’s home above. David and his young wife, and the three children we see at weekends scuttling in and out of the shop, actually live in another village four miles away. His wife is a nurse. They have been making bread locally for eight years. 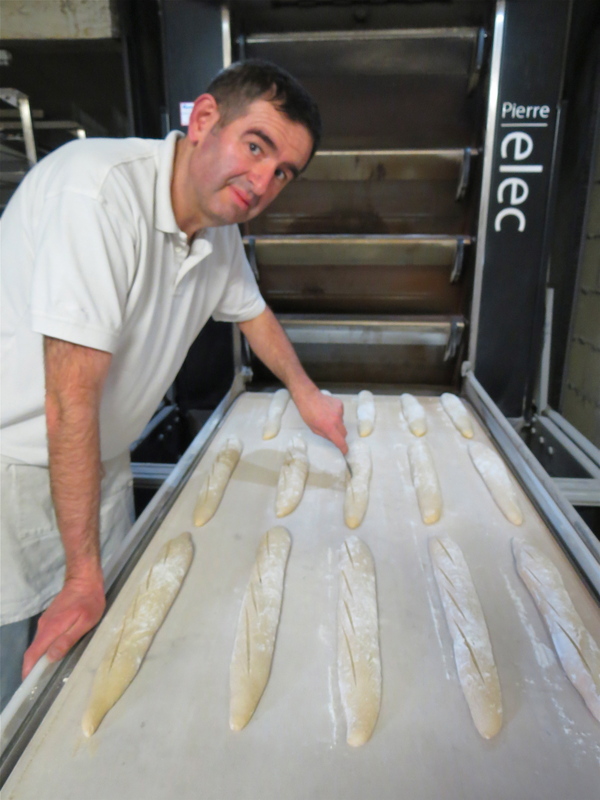 It then turns out that for 12 years before that, David taught the art of baking at France’s national bakery institute, and as he explains how his flours, doughs and oven-times all work together I realize we are talking with a master craftsman. This is reinforced when we find out that the friend he holidays with is the president of the national baking foundation. This snippet of information is followed by a conversation which involves discussion of air, kneading, yeast, temperature, flour mixes and the vagaries of different forms of heating. I am amazed at the breadth of baking experience we are lucky enough to have in our little village. As we leave, I spy a sack of thirteen huge loaves in the corner. They are something we do not see in the shop and I ask where they are going. “Ah,” says David with a grin. 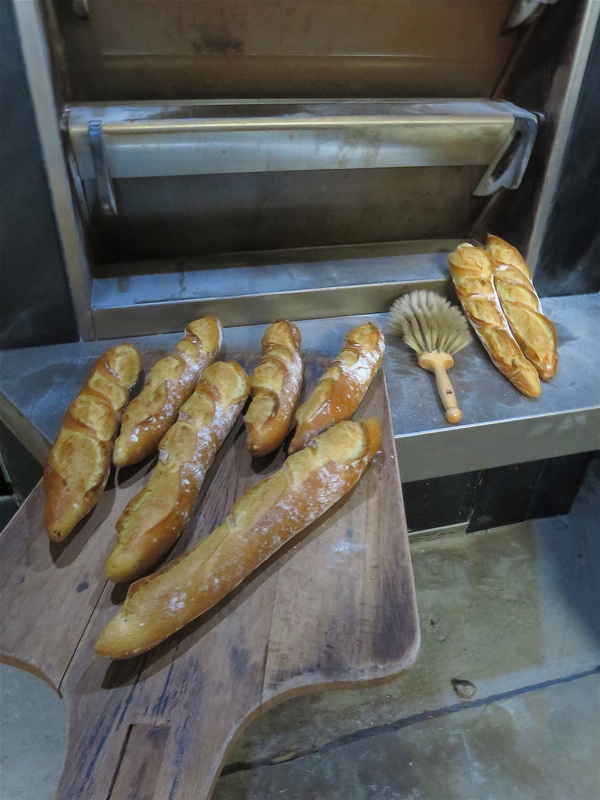 “They’re for the old people’s home – they like the traditional white bread, but not the crust, so it is easier to chew, I make theirs specially for them” I am amazed for the second time how lucky we are to have not just a craftsman, but such a gentleman in our village.